The waiter approached with his white platter of appetizers, complete with a rainbow of exotic sauces and freshly baked naan. As he gently placed the platter on our table, he caught my eye. And what will you two be having this evening? We anxiously rustled through our menus, making our final, last minute decision. Lamb korma and chicken tikka masala. Just like the last time and the fifteen times before that. I guess you could say we're pretty predictable. I have that problem with restaurants. I find something I like and I just can't stand the unnecessary risk of trying something new. J's the same way. So lamb korma and chicken tikka masala it was, once again. When we lived near DC, J and I frequented Tandoori Nights at least once a month for our fill of incredible Indian food. Moving to Grove City meant saying goodbye to our monthly Indian outing. So when I saw this tempting recipe for butter chicken (a common Indian dish) on Pinterest, I added it to my weekly list of meals. The problem? 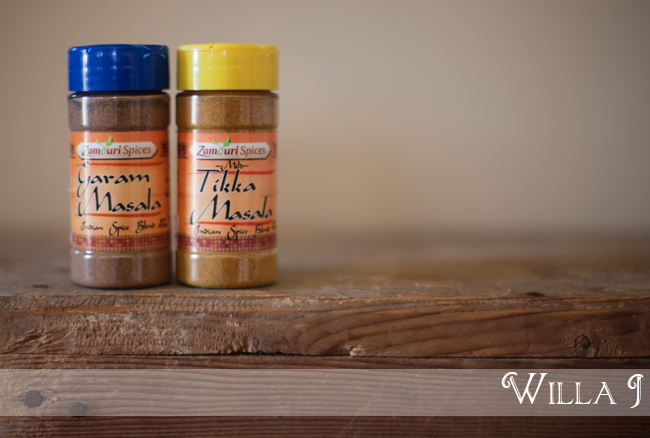 You just can't find most international spices in good old Grove City. In fact, I couldn't even find cardamom at our local grocery store. Cardamom! So garam masala? Yeah, that definitely wasn't going to happen. I contemplated driving into Pittsburgh to pick some up at the Strip District, but then remembered Amazon. Holla! Within two days, I had the necessary spices at my doorstep. And I'll tell you, the butter chicken was out of this world:).